Instantly sync projects, photos and documents between your CompanyCam and JobNimbus accounts. You must have an active account with both CompanyCam and JobNimbus in order to integrate the two services. 2. Click on API on the bottom/left. 3. Click 'New API Key' (blue button). Click in the open/white field and type CompanyCam. Click 'Select Profile' and choose 'Admin' from the list. Click 'save' (blue button). 5. Open CompanyCam and log in. Hover over the upper right corner & select 'Company Settings' from the drop-down menu. 8. Paste in the API KEY that you copied from your JobNimbus account. 9. Enter your ADMIN EMAIL ADDRESS from JobNimbus. The integration will only work if the email address you enter is an admin in both JobNimbus and an admin in CompanyCam. 10. 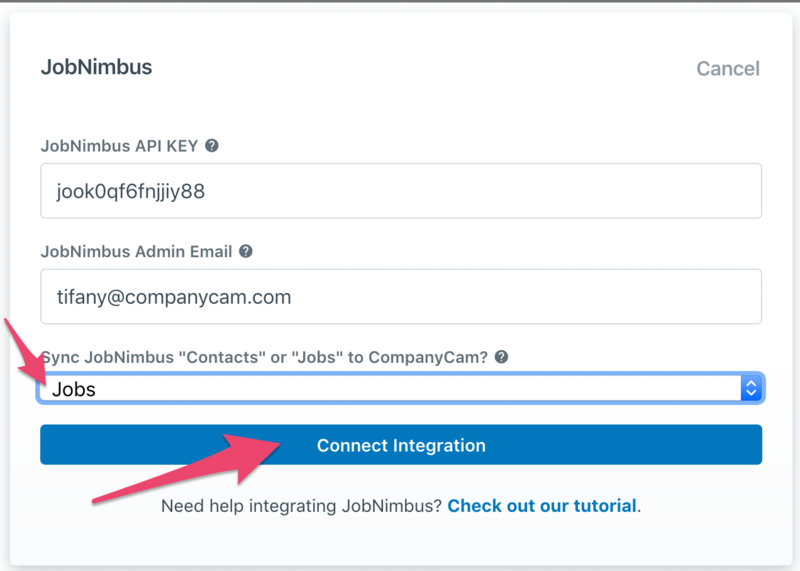 Choose to sync 'customers' or 'jobs' from JobNimbus to CompanyCam, and save this information by clicking 'Connect Integration'. 11. 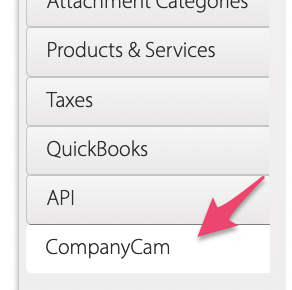 Now, in CompanyCam, click Access Tokens in the menu near the top of your screen. 16. 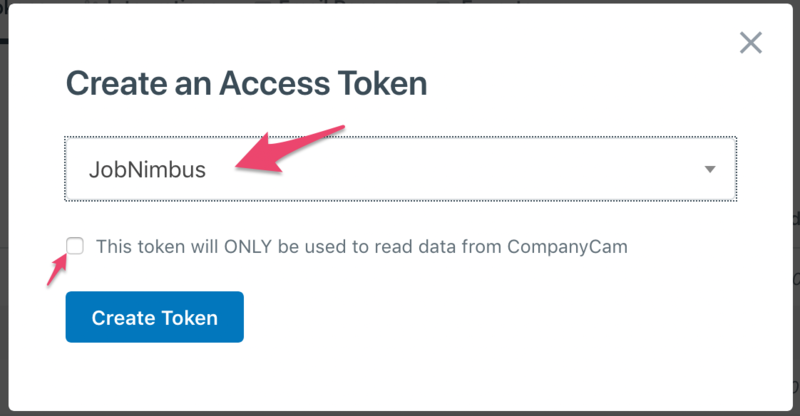 Paste the token from your CompanyCam account and choose Contacts or Jobs. Make sure to choose the same as you did in Step 10 (see above). Click Save Changes. To make the integration work smoothly there are a few things you’ll need to keep in mind. On setup, your 100 most recent jobs/contacts will sync from JobNimbus to CompanyCam. 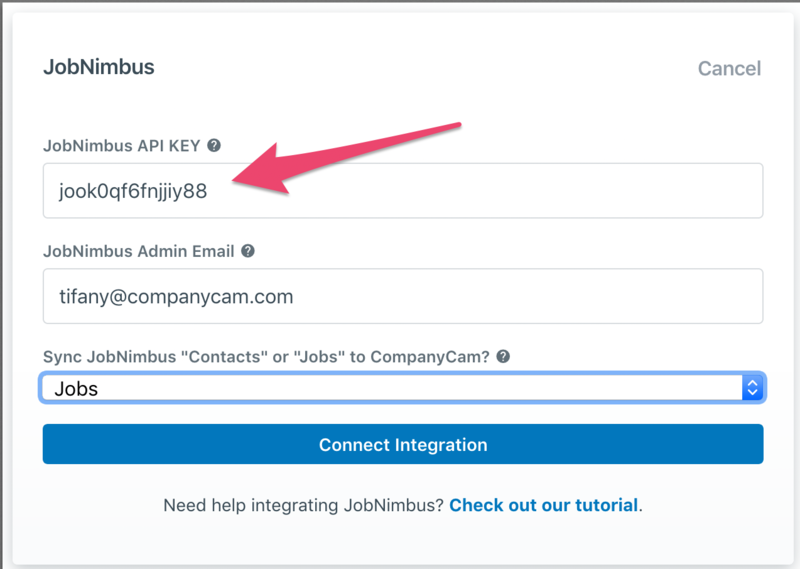 You'll know the integration is set up correctly when you see your JobNimbus jobs/contacts in CompanyCam! 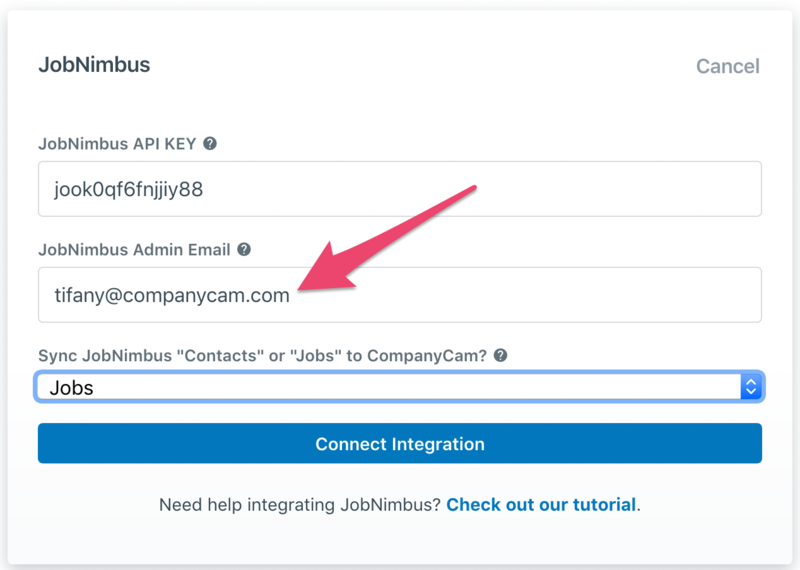 If you have an older job/contact that you want to merge over to CompanyCam, simply edit the job/contact name in JobNimbus and save, this will force sync the job/contact to CompanyCam. Customers/Jobs will sync from JobNimbus to CompanyCam, but not the other way around. Customers/Jobs that you create in JobNimbus will instantly sync to CompanyCam, but projects that you create in CompanyCam will not sync to JobNimbus. Photos and Documents will sync from CompanyCam to JobNimbus, but not the other way around. The photos your company takes in CompanyCam as well as documents that you scan or upload will all instantly be available in JobNimbus. Photos that you take or upload in JobNimbus will not sync to CompanyCam.